The strategy-game-meets-Tinder is headed to Westeros. Plenty of games have explored the ins and outs of ruling countries, and the likes of Age of Empires, Civilization and Crusader Kings remain fan favorites as complex empire-creation simulators. 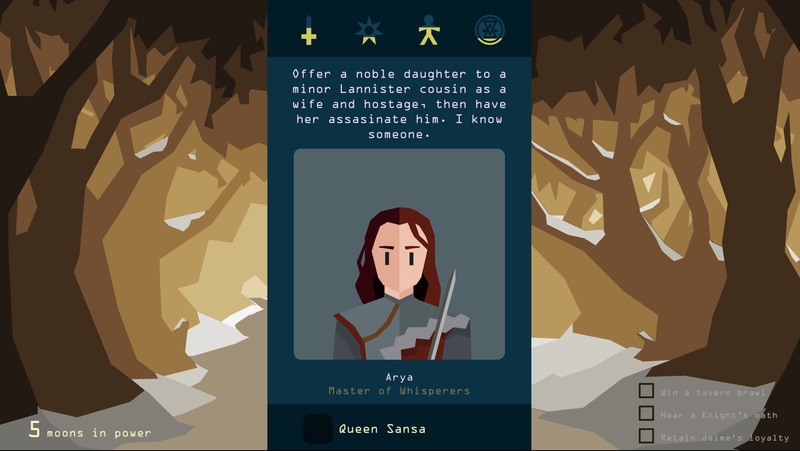 The 2016 mobile game Reigns took a very different angle: Condense kingdom management into short dialogues with influential people, where the wrong choice -- symbolized by a Tinder-style swiping to agree or disagree -- often means instant death. But through the king's (or in the 2017 expansion Her Majesty, queen's) heirs, the country takes shape. If that sounds a lot like Game of Thrones, well, I've got news for you: A new version of the game is slated to come out in October for iOS, Android and PC that's set in the bloody, scheming world of Westeros. It's up to you to decide who sits on the Iron Throne -- one conversation/card swipe at a time. The game plays loose with both Game of Thrones' characters and Reigns' dynasty-building mechanics. It begins with the sultry red priest Melisandre staring into the fires, asking her god R'hllor who is destined to save the land, and each playthrough becomes a vision of how that character would rule. Instead of playing through heir after heir of a bloodline, once a ruler dies the game rewinds to let you start over as one of Westeros' heroes and villains. 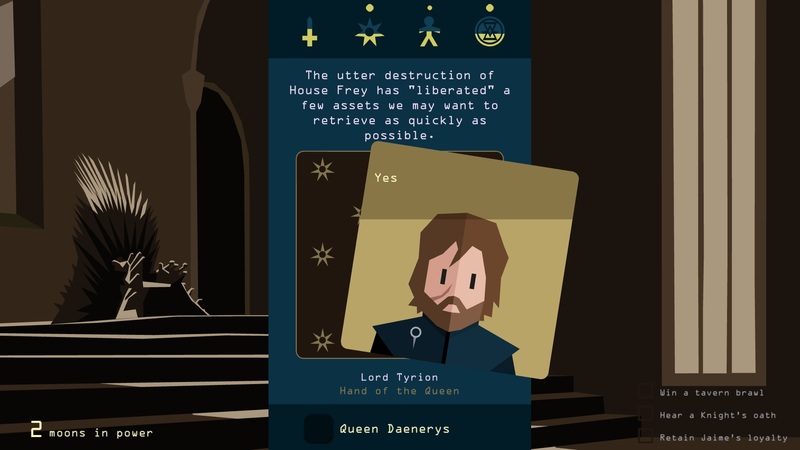 It's a little hand-waving compromise to fit the franchise into Reigns' rules, but it liberates you from the series' plotline to have fun with the game's basic premise: How would each beloved (or long-hated) character rule the seven kingdoms? If you've never played Reigns, the game is simple: You, the ruler, are petitioned by individuals who appear on a stylized card with their suggestion. Swipe left to accept, or right to reject it. What you choose may benefit or harm four "scores" representing military might, religious favor, popularity with the people and state gold reserves. You aren't told whether a choice will make metrics go up or down, and if any of them should peak or bottom out, your ruler will reach his or her (likely violent) end. In essence, it's a balancing game that fits Game of Thrones' political intrigue and power jockeying. But as in the original Reigns, it's easy to start ignoring every choice's flavor and fixate on the scores as you desperately try to stay alive. While players start over after each death, progression works just like the original games. Conversation choices will lead players down different pathways that might introduce new challenges, advisors and even additional rulers (you start with Daenerys, with more unlocked as you play). These open up new possibilities and ruling options. for future playthroughs and enrich the game, But since those are randomly assorted, you might have to play characters over and over again until a different path opens up, which can be a drag. As a fan of the original Reigns games and Song of Ice and Fire books, Reigns: Game of Thrones is an enjoyable jaunt mixing great bits from both worlds. Functionally, it's the same game as the original, with a lot of the same choices rewritten to fit in this universe. Even then, it's wicked fun to see how long you can (say) keep Tyrion in power before a faulty choice ends his reign. Or, as Sansa Stark, see your sister Arya ask who deserves a good murder. Lots of familiar faces appear, letting you stack your court with favorites from the series -- and while the White Walkers indeed threaten the kingdom from beyond the Wall, your ruler might sooner be done in by an assassin or vicious mob. Whether Reigns veterans should pick it up depends entirely on how tickled they are to play in Game of Thrones' dramatic sandbox. I loved sending Jon Snow to rule since he brought the ever-faithful Samwell Tarly to advise him. I even got Sansa Stark to serve as Hand of the King, which was a top moment until I got to start with her on the throne. The game even gets a bit into the series' signature uncomfortable territory, letting you choose whether Danaerys and Jon continue their shady romance once they know their shared heritage. Backed by Ramin Djawadi's now-iconic soundtrack and drawn in Reigns' minimalist pastel style, the game is a sublime little experience for its $4 price tag -- and is a great simulator if you've ever bet you could run Westeros better than those fools on the screen or page.